A couple of great data points out of today’s opening keynote at the EEC. If you need more ammo on the need to build a quality email list and create campaigns with a high level of relevancy here it is. I am in San Diego at the Email Experience Conference. This is an exciting event as it is really the first time that this organization has ever really focused any true energy on this channel. I spoke on the first day at the Email Boot Camp with fellow email industry veteran’s Austin Bliss of FreshAddress and Karen Talevera of SynchronicityMarketing. What was exciting about the session is that it was filled with individuals from great companies who are new to the email channel. It reinforces what we have been saying about email marketing. The industry is growing and the opportunity for companies that want to figure out how to use it properly are great. The first night kicked off with a cruise of San Diego harbor. It was the perfect way to start this conference. Participation was great (the boat was filled to capacity), and everyone had an opportunity to mingle and network in a wonderful setting without any distractions (other than the beautiful skyline). I have to say being out of Chicago where the windchill hit 40 below, also was an added bonus. I’ll try to provide more updates on the conference as the week goes on. The DMA conference wrapped up this week, and it was a great week. 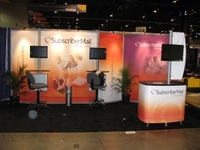 First of all, for us at SubscriberMail, it was the unveiling of our new branding (logo, booth, etc). For us that is significant. However, I think more significant was a subtle shift in the DMA’s attitude towards the digital marketing community. Those of you who have followed this blog over the years may have seen my posts here about how in past years the email marketing community has been treated as the ugly stepchild of the direct marketing industry. Well, this year, it seemed like we were finally accepted into the family. No more digital ghetto (like last year), no lack of an email category in the directory (like the previous). Digital was front and center. A major section in the main hall at the show. It is great to see this organization moving in a digital direction. Let’s face it, direct mail is not dead, but it has been severely wounded by mounting postal rates an increased focus on “green marketing,” and consumer responsiveness. This is the industry I grew up in, so I don’t want to see it harmed, but I also realize that it is undergoing dramatic changes. What remains to be seen is where the DMA weighs in on the legislative side. As a lobbying organization, their primary focus is still on postal rates. There are many major challenges facing the digital side of the industry from a legislative perspective. DMA has the ability to assume a leadership role. They also have the ability to mess it up royally (like they did when it came to defining opt-in). As a member, I’m hoping they move in the digital direction. I just listened to the Email Experience Council (EEC) and DMA’s joint conference call announcing that the DMA has acquired the EEC. This is exciting news on one front, but also causes concern. Perhaps it is finally DMA’s recognition that email is really an important component of the marketing mix. Many DMA members have been using email for some time, but DMA’s reputation in the area of supporting the community and focusing on the critical issues to the industry has been disappointing. The concern is that DMA is an organization that has traditionally focused on non-electronic communications. Their lobbying efforts are focused on postage rates and legislation related to the sending of catalogs and envelopes. The question is can they change this to address this new group, or is this going to be an acquisition that sours like the Association of Interactive Marketing (AIM) that was a disaster for the interactive community. Back then, the DMA just did not get it. With the DMA under new leadership, perhaps now they will. So kudos to Jeanniey Mullen and her team at the EEC for building a great organization in a very short amount of time. Those of us in the community are looking for great things in the future. Well three great things have happened this week for the email world. The first was AOL's position change on their enhanced whitelist. Matt Blumberg at ReturnPath had a great post earlier in the week about this. Matt also did a great job on CNBC's Power Lunch (you can see the video clip on his blog as well) explaining why the GoodMail/AOL plan to charge mailers for delivery was not good idea. Today I learned that the Hawaii legislation mentioned in my earlier post was not brought out of committee, and is scheduled to be brought up again next week. This is due in part to reservations raised in testimony by the Hawaii Attorney General about the legislation (including references to CAN-SPAM and the potential legal hurdles). I spent time on the phone with several State Senators in Hawaii, and it was clear from our discussions that they realized they were not given all the facts. It is great to see a slow-down in this steamroller. Finally, the court in Utah agreed to accept an amicus brief filed in the case their by several advertising organizations (including the Email Senders and Providers Coalition). The only down side to this is that one major organization was missing from the list. The DMA. I had great hopes after conversations with John Greco that the organization was changing, and posted about this last year. Well the DMA has burried their head in the sand and once again has turned its back on the electronic side of the direct response business. I guess regardless of the headline, those of us that pay dues to the DMA, would expect it would take the position that is best for its members. DMA / AIM - New Direction? Several readers have wondered if John Greco of the DMA response to my post about the annual conference and the DMA's attitude toward the email community was lip service, and everything will remain status quo. Last week I had a call from the new Executive Director of AIM (the DMA subsidiary focused on Interactive Marketing) Michael Aronowitz, This is the first conversation I have had with him, and I felt that he is ready to dig in and start rebuilding an organization that was taken in some extremely odd directions by previous executives. By rights, AIM should be the leading voice for the interactive marketing community. When founder Andy Sernovitz sold the association and turned the keys over to the DMA, the organization was strong and growing. Today it is a pale skeleton of what it once was. Here’s hoping Michael can reverse the trend. He sounds like he is ready to listen to the membership and try to integrate the interactive audience into the DMA to help give us a stronger voice in Washington. What will happen remains to be seen, but Michael is saying the right words. But as they say the proof is in the pudding. I posted last week about my thoughts that the DMA is not doing a great job servicing the email marketing community. Based on Matt Blumberg's comments, I sent a copy of the posting to John Greco at the DMA. I have to say that I am impressed. John sent me an email the next day stating that "email is very much on my radar screen". Today I received two phone calls from DMA staffers about my message. I didn't have a chance to spend any time with them on the phone, but plan to call them back. Maybe change is really happening.